Han’s Worst Hits of the 70’s entry today comes from 1975- Lovin’ You- Minnie Riperton- if you wanted to get info out of a terrorist- forget waterboarding- play this song on an endless loop and they would quickly reveal every secret piece of information they have [ playing a Yoko Ono album at high volume would do the trick also- wasn’t it Manny Noriega who they drove out of his compound by blasting Led Zeppelin? One Yoko album would have done the job a lot faster.} This is probably a song you either love or hate. Lovin’ You hit #1 on the Billboard Hot 100 in April 1975- it came off of her second album Perfect Angel. It would be her only hit oddly Lovin’ You was the 4th single from the album- the first three singles didn’t even get into the Hot 100. Minnie Riperton had an amazing voice- a four-octave coloratura soprano. Loving You is known for Riperton’s high whistle register in the songs bridge and also for the chirping songbirds throughout the song- the bridge is what you remember even if you heard the song only once. This song is also one of the few #1 hits on the Billboard Hot 100 that doesn’t use a percussion instrument in the song- Time In A Bottle- Jim Croce and Yesterday by The Beatles were the others. A lot of people may remember the song being used years ago in a Burger King commercial. Sadly, Minnie Riperton was diagnosed in early 1976 with breast cancer and given six months to live. She bravely continued touring and recording and was also one of the first celebrities to go public with her breast cancer diagnosis -although she didn’t announce she was terminally ill. Minnie Riperton passed away much to young at the age of 31 in July 1979. She had an incredible range but, this song makes me shudder. 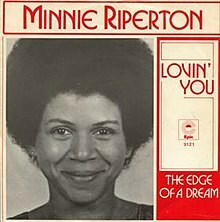 I loved Minnie Ripperton’s voice and I liked this song very much. So did the other teenage girls I knew who romanized relationships. Whenever my husband does the high note, he just screams. I’m like, “It wasn’t THAT bad. Come on!” But it was pretty close. It’s still a pretty tune, though.